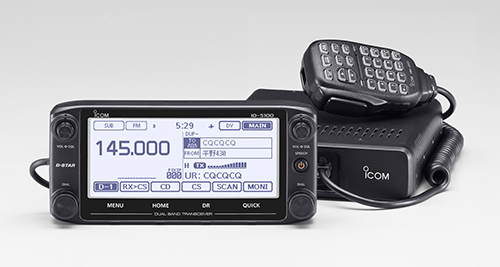 The NEW Icom ID-5100 D-Star mobile radio! I don’t know much about this one yet, but here’s the link to the Icom Japan site for the new ID-5100 D-Star radio. This looks to be a nice addition to Icom’s D-Star lineup. I don’t yet know the particulars, but it appears to be a “hybrid” between a ID-7100 and an ID-51A HT. I can’t tell if this will be a true dual bander (monitor 2m/440 at the same time), but I sure hope so (this is my biggest gripe about the IC-7100). I’m very intrigued that this radio will apparently have some type of android app related functionality and bluetooth capability. I can’t wait to see how that will work. Of course, like the ID-7100, ID-31 and ID-51, this radio will have the “near repeater” capability with a GPS; one of my favorite features of these radios. The web site indicates a late February release date in Japan, but there’s no telling when we will see it in the USA. I bet they will have one on display at Dayton this year. I would be willing to test one out for them! Hint, hint! Thanks to Mark and Will at the Atlanta HRO store for alerting me to this potentially great new radio. Please comment here if you learn more. This entry was posted in Uncategorized and tagged D-Star, ID-5100. Bookmark the permalink. 9 Responses to The NEW Icom ID-5100 D-Star mobile radio! We got this ingo a few days ago. Looks like is has dual DV receive. That is a major plus!!! This is really an interesting xvcr. for Dstar replacing I understand the 2820.
happen if Main is 2m and Sub is 70cm or vice versa. ?????? Price being thrown around is $825 for the 50w version. Thanks for sharing, I recently heard about this radio also. I’ve been looking at getting into DSTAR, so might have to grab this radio when it finally drops. Any news on the release date? No officeial word on the release date of the 5100, but rumor has it we will see it for sale in the USA sometime in April. That may all depend on the speed of the FCC certification process. For $35, Ham Radio Outlet is currently taking reservations for the 5100. The deposit is refundable and will apply against the price of the 5100 if you buy one. Other vendors may be doing this as well. Gigaparts.com is doing the same thing. I’ve bought from both of those vendors before, you’d be good going either way. I wish I knew what the rough asking price was for. I’d pay the $35 reservation fee, but I don’t want to find out later that the radio is going to retails for $1100. Icom is very proud of their equipment, and often over-priced, imo.